THE nursing profession was one I never actually considered when I was mulling back then what career path to take. But in the past few months that I’ve been in and out of hospitals on account of my mother’s illness, I’ve found a new and healthier respect for the nursing profession. Not that I ever disrespected nurses before. It’s just that at this point, after having dealt with them on a more extensive basis, I can only say to them, “Bow ako sa inyo.” It is a job with a special calling, much like the religious vocation. Many have applied to become one, but few actually pass to become efficient and caring professionals. In truth, nurses are not second-class citizens in the health-care sector, because without them, even the doctor’s world wouldn’t really revolve as smoothly as it’s supposed to be. Behind every successful doctor is a most efficient nurse. The nurses I’ve met at the Philippine Heart Center (PHC) and at the National Kidney and Transplant Institute (NKTI) are not only the most competent but they are the kindest as well! Someone like me who has been trained to smell BS from the people I interview, I could not detect any falsity or fakery in these nurses’ behavior or attitude toward Mama. They appeared very genuine in their concern for her—always making sure she was at ease or far from discomfort when they stuck a needle in her, or took her blood pressure, or did some other tests. Believe me, it isn’t easy to deal with a makulit old woman like my mother—as well as her attendant boisterous and equally makulit entourage (meaning us, her children and grandkids)—but these nurses just passed with flying colors each time. Some of them even went the extra mile just to make sure Mama was well cared for even when they were no longer on duty. J. for example, was supposed to have ended his shift already when Mama was about to undergo an important procedure in another building of the hospital complex. Instead of leaving her in the care of the rest of his colleagues, he helped wheel her bed to the surgery room, going on unpaid overtime just to ensure she would be alright. Then there was also this sweet girl L. who was always so super efficient—she would write down all instructions we should follow to continue our home care for Mama, and photocopied each and every test result for us, without having to be prodded. Similarly, L. went the extra mile for Mama, and went to bat for us when she found out that one of our doctors had charged us P10,000 for his professional fee when he only saw Mama twice. (Apparently she protested to the doctor’s secretary that he only came in once to see Mama, as per the nurses station’s entry.) I mean, how could we not love this nurse?! She was just mortified that the doctor could be so financially demanding. Privately, and away from the ears of these super-nurses, we as a family would often wonder what would happen if we were in some European country or some hicktown in the US where their citizens still dominated the local nursing profession? Yes, Mama would probably get the same standard of professional health care from those nurses, but what she definitely won’t receive is that extra cariño, that familiar Filipino concern for others. 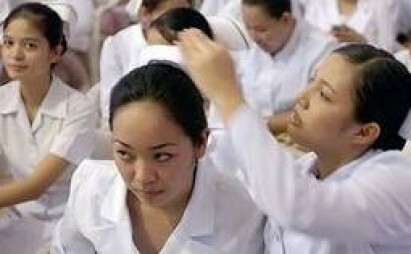 It’s that extra affinity or empathy from Filipino nurses toward their patients that make them of course such a hit abroad, that foreign hospitals just can’t hire enough of them. L. didn’t respond. It was as if her fate was sealed. She would leave this aging government hospital, and go care for richer patients abroad. Those patients will be lucky to have such a fine young woman, who would give them expert care with an extra dose of genuine concern. How unfortunate for us though to lose her and many of her colleagues. But, my hats off to all you nurses. You may not be recognized as the stars in the hospitals you work for, but in my book, you are tops. Your healing touch is what makes every patient’s hospital confinement less miserable. I especially want to make a shoutout to those who took care of Mama at the PHC and NKTI...if you ever read this, you know who you are. Thank you for your warmth and special regard for her. You’re the best!